Want to join the Food and More? This Shannon's Cookbook Ring site owned by JunieBug. Index of Shannon's Cookbook Ring. Want to Join the ring? Get more Info. This Recipe Swap Ring site is owned by JunieBug. This Chef's Ring site is owned byJunieBug. 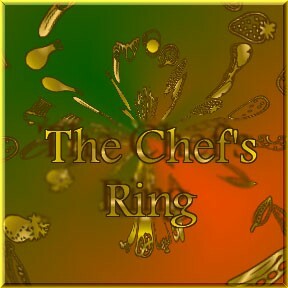 Click here for info on how to join The Chef's Ring. If'n ya came by way of a webring, just click mah "Back To The Kuntry Kitchen" to begin yer browsin' thru mah home. And Welcome! If'n ya wanna come back here jus' go to the main page and Click on the Rings. Enjoy!! !